This project, which also received the Associated General Contractor's Austin Chapter 2013 Outstanding Construction Award in the Industrial Warehouse 2 (over $5 Million) category, was a particularly complex project consisting of a sloping hill with a creek running through the lower terrain. The civil design called for four retaining walls which allowed the site to stair step down to a creek. The first “step down” on the site was built to create a flat area large enough to accommodate the 124,000 square foot retail facility and parking lot. The wall that forms this first “step” is the most challenging: at 20 feet tall and 825 feet long, it runs parallel to the street and the store. This wall is 20 feet from the street and only 13 feet from the store and the roof of the store is level with the street. The lower long wall which is the final “step down” follows along the creek’s edge and approaches 15 feet tall in places and is over 1,200 feet long. To allow for the volume of water that ran through the site a very large detention pond was constructed below the lower wall to hold the creek’s overflow. 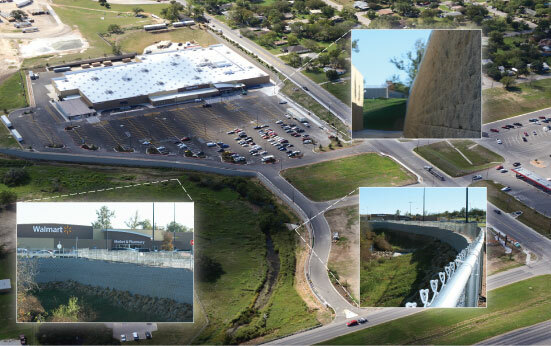 The Emerson team also initiated a significant design change, working with the Wal-Mart representative and the civil engineer to completely change the design of the retaining walls. The process of redesigning the walls required our team to rethink the critical path and develop a unique resequenced construction schedule to give the design team time to finalize plans and still complete the building by Grand Opening. The design team included SGA Design Group and Doucet & Associates.